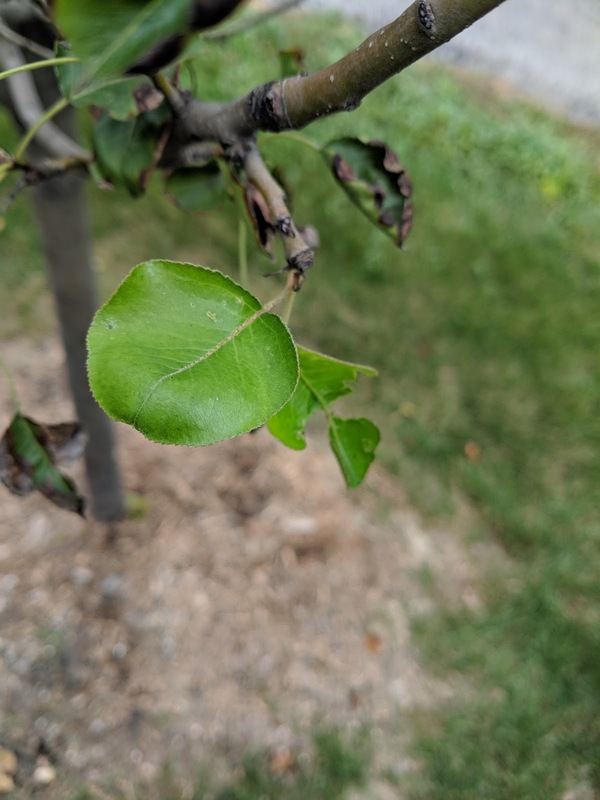 We had a large 3" caliper Chanticleer flowering Pear tree planted on the north side of our property kind of close to our garage out in front before we moved in. It is a fairly columnar, fast-growing tree that while isn't super awesome, does give us some quick growth and a fairly mature tree relatively quickly. Or so we thought. That tree didn't survive the first year. It was in trouble last year and didn't come back this Spring. It was removed and replaced this Summer. Here's the post showing off the newly planted 3" caliper replacement tree from June of this year. 1. I watered the heck out of it. 2. It is in a clay bowl with questionable soil. Which lead to it being overwatered and drowning while it gasps for oxygen. What lead me to this conclusion was doing a little digging and figuring out that after I had not watered it for a couple of days, the soil was soaked all around the tree ball. Almost immediately after planting, the leaves were wilting and turning brown on the edges. The tree was thin and not happy at all and what little growth there was quickly wilted and browned. The internet told me to take my fingernail and kind of scrape a little bit of the bark to see if there's green underneath. That would tell me if the tree was alive. I've been doing that most of the Summer and each time, I got green. So, that's good! But, I knew I had to do something to try to save this thing from being drowned. I got out my shovel and started to dig out/around the rootball and quickly realized that there was nothing but clay around the tree. And it was turning it into what they call the 'bathtub effect'. What's the bathtub effect? It is where due to the heavy clay soil that traps water, the water tends to stay put and just creates a tub of water that the roots lay in and are deprived of oxygen. So, my digging with my spade told me there was a problem, but the spade itself wasn't going to solve the clay situation. If you read my post about planting a Bald Cypress a few weeks ago, you know that I was dealing with an adjacent location and that I used the post hole digger to break through BELOW the clay layer to ensure that the hole was draining. That's the approach that I ended up taking with the Chanticleer Pear. The tree is planted on an incline, so I decided to dig deep on the downside of the incline and get deep below the clay layer. That mean that I basically dug a couple of vertical drainage channel that would funnel the excess water away from the rootball and down into the layer below the clay bowl. I also dropped a little bit of gravel into the bottom of those vertical channels to ensure that there was some air/space in there too. All of this backstory is to say: look at the photo up top. I took this a week ago in late September. But, guess what? There's NEW growth on the tree. That's a brand new, healthy green leaf that emerged from one of the branches. There are these new leafs springing up all over the tree. You can kind of make out the browned-from-the-edges leaves behind this new one in the photo above. So, what does that mean? I'm hoping that the new growth coupled with the continued 'green' being behind the fingernail scrapes means that the tree is surviving. And perhaps, establishing itself a little bit before Autumn. It also could be the last gasps of life for the tree? I saw with the little Fraser Fir that we planted and lost this Summer that the tree threw off some big, happy, lush new growth. Then dried up and died completely. Like that growth was its last gasp of life. I'll watch for buds to be set and keep my fingers crossed that maybe, just maybe, this thing is going to survive.